The biggest story concerning Zodiac before this weekend’s release was its filming. “David Fincher does 86 takes on mundane stuff!” was the kind of thing you read about the film, that it was supposed to be released late last year, pushed back to January (there would certainly have been issues if it opened then), then March. Considering that Fincher has three awesome movies under his belt (Seven, The Game, and Fight Club) and one that I guess people in general like (Panic Room), and one that time has either changed people’s minds on or has acquitted the director of any wrongdoing (Alien 3), Fincher has earned respect. With Kubrick gone and James Cameron seemingly never finding a post-Titanic feature project, the film world needs a guy like Fincher who demands things go his way or else. The film Zodiac concerns one of California’s infamous serial killers of the late sixties and early seventies who sent cryptic messages to newspapers claiming the solutions revealed his identity. He was never caught. But as Zodiac reveals, there were some suspects who eluded the law who were dismissed as suspects by technicalities. The beginning of the film is a bit worrisome, since Fincher focuses on crime reporter Paul Avery (Robert Downey, Jr.) and cartoonist Robert Graysmith (Jake Gyllenhaal) and their particular focus on the Zodiac murders. 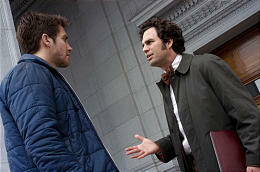 Then it shifts to detectives David Toschi (Mark Ruffalo) and William Armstrong (Anthony Edwards). For awhile, as Toschi tracks down every lead imaginable and runs into problems with Avery’s meddling, it appears to be Mark Ruffalo’s film, but once the investigation turns cold, it’s all Gyllenhaal’s. By the same token, it’s when it becomes the obsession of Graysmith to find the Zodiac with all the newspaper articles and hint-hint, nudge-nudge help from the investigators who once poured over the case (including chiefs from different cities played by Donal Logue and Elias Koteas), that the movie becomes compulsively watchable. We understand completely the aspects of obsession and how it ruins lives, and Fincher does this without melodrama, a huge plus. It’s sort of a combination of The Pledge and The Usual Suspects. And a remarkable feature of the film is once the killing is over, the tension is ratcheted up so that once that messy beginning is over, it doesn’t matter you’ve sat in the theatre for nearly three hours. Even better, Zodiac offers a conclusion on who the killer was, without actually saying it point blank. So you can leave without being frustrated over numerous possibilities. This one’s a winner. Go see it. I though this was amazing - a new kind of crime thriller from the man who already re-invented it once before with ‘Se7ev’. It’s rare that we get a top ten caliber movie in March. I think it’s a masterpiece of it’s kind. Yeah, I agree. Remember it was supposed to be one of last year’s fall films, so it’s not a big surprise that it’s such a quality movie. Although March movies can be good no matter what: last year’s Inside Man is a good case and point. Sweet. I love knowing that Fincher has made another great film. I can’t wait.